Elise Loehnen, editor-in-chief of online shopper's delight Beso.com, arrived in Venice Beach by way of Missoula, Montana, after a decade-long detour in New York City. 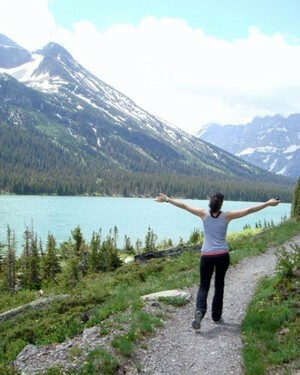 Here she shares her best day ever in Glacier National Park, three hours north of her hometown. 1. For me, the best day ever starts with a breakfast of slightly congealed eggs and Frosted Flakes in the Interlaken Room at Many Glacier, an Alpine-themed lodge nestled on the eastern edge of Glacier National Park. 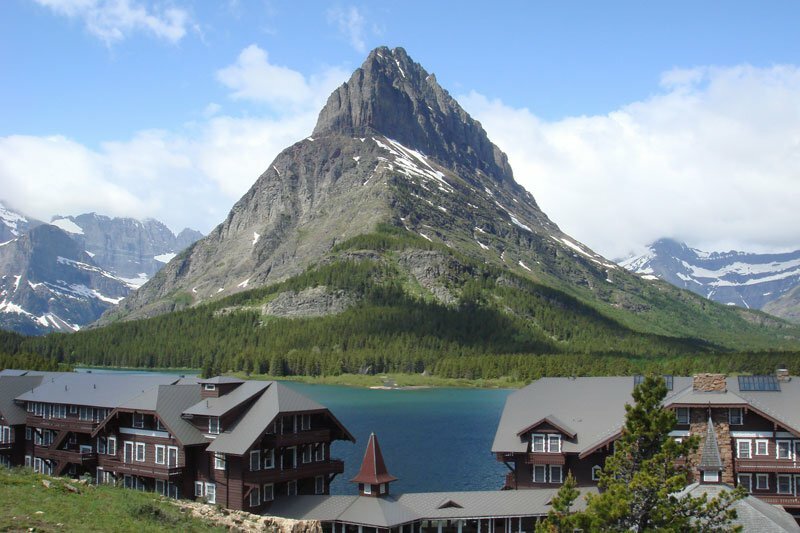 Opened in 1915, it's pretty much frill-free (save an amenity list that boasts Super-Topper mattress covers, alarm clocks, and eco-friendly light bulbs), but it sits on the edge of a cerulean glacial lake facing an incredible vista of peaks, valleys, and year round snow. This is Glacier after all, which is one of those places that is so mighty, it makes you feel insignificant and small. 2. After breakfast, I like to sit back in one of the rockers in the main lobby and crack open the paper in front of the perennially blazing fireplace, which conveniently is the size of a small dance floor, as is the general predilection of the park service, or take in the taxidermy-laced walls, or shop the gift store for Bob Tail Feather porcupine quill bracelets, Pendleton blankets, huckleberry lip balm, and bear spray. 3. 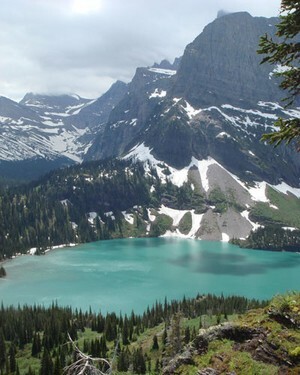 At 9:30, it's time to pick up my pre-ordered pack lunch (an apple, a candy bar, some sort of cobbled-together "vegetarian" sandwich), and set out for a day hike, either twelve miles round-trip to Grinnell Glacier, a swiftly shrinking ice field that sits beyond myriad gemstone-hued glacial lakes, or the slightly shorter adventure to Iceberg Lake, which is, as its name suggests, a body of water that boasts mountable icebergs, even in the prime of August. Usually, the course is determined by grizzly bear sightings in the area and — not unusually — early or late snowfall. Sometimes dangerous snow bridges last through the entire summer, which have cost hikers their lives. Both hikes wander through the sun-laced woods for a while before lifting up above the tree line. Despite their length, neither is particularly tough-going. In fact, I've never been on the trail without seeing at least one post-retirement guy attempting the trip in jeans. The only thing to consider is that the temperature can drop if the sun goes away, so it's best to pack some layers, some goop (not of the Gwyneth variety), some sunscreen, and fresh socks in case of wet feet or blisters. 4. Post-hike, nothing is quite as satiating as flip-flops and a pit stop at the general store that's adjacent to Swiftcurrent Motor Inn (i.e., the only game in town outside of the snack bar and restaurants at Many Glacier), which has a freezer full of Haagen-Dazs bars and a fridge laden with Coors Light and Budweiser 40s. 5. It's time to load into the car, drive east out of the park, down south, and back into Glacier via The Going to The Sun Road. Remember the opening sequence of The Shining, when a camera hovers above Jack's car as it surmounts an insanely gorgeous, eerily empty, winding road? 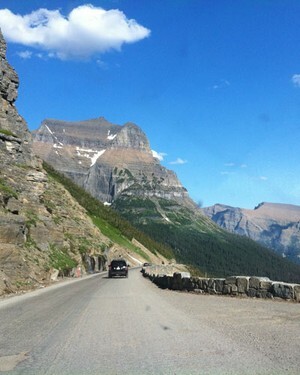 That's the eastern end of this famous, 50-mile stretch of asphalt, which literally lifts you up to touch the sky as you cross the Continental Divide at Logan's Pass. On the way down, you get to hug the inside of the scarily narrow road as you plummet through Glacier's heart, passing innumerable waterfalls, and just as many turn-of-the-century red buses that tote camera-wielding tourists to the top. Here's a music mix (free download!) that underlines the range of emotions I always encounter as I navigate its twists and turns: The mountains are so mighty and timeless; they're an enduring reminder that my life is oh-so-wee and oh-so-fleeting in comparison. 6. As you reach the bottom of the valley, you'll pass an endless sweep of woods and lakes that feels straight-out primordial, all helped by the fact that there's not even an inkling of a cell signal until you're well outside the park. I always enjoy those final few minutes. If you need to use the restaurant, make a pit stop at Lake McDonald Lodge, which is yet another crazy cool destination on the National Park's roster of crazy cool lodges. 8. As dusk falls and you encounter the southern edge of Whitefish, take a right toward the lake (which takes the shape of a fish), and follow Highway 93 into the center of this old-time cowboy town. It has its fancy parts — thanks to its proximity to some resorts and a skill hill — but at its soul, it's still a small Western village, complete with a street of saloons. Each is more compelling than the next. There's Remington (Keno! ), there's Great Northern, and, well, it goes on and on. 9. There are a handful of restaurants (Buffalo Cafe for breakfast, for sure): If I'm in the mood for something that's Western-with-nice-napkins, I go to The Lodge at Whitefish Lake and snag a table with a view of the water (it's also one of the fancier places to stay). Otherwise, I turn back toward Glacier and head to The Belton Chalet, which lives in an old railroad depot. The attached restaurant is delicious and the rooms are blessedly quiet and frill-free: No TVs, for one. Essentially, it feels as pious as camping, but with a shower and heat. Elise is the editor-in-chief of Beso.com. She travels for the things she can't find at home.